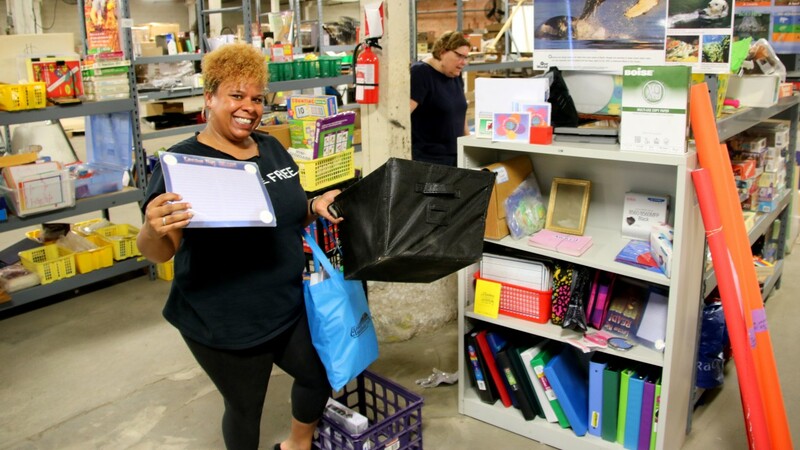 The school year was about to be over, but at the Baltimore Teacher Supply Swap — a big warehouse space brimming with binders, felt-tipped pens, stacks of copy paper and much more — the action was hot and heavy. This is the busiest time of year for the three-year-old organization, with teachers grabbing things they know they will need next year. Meanwhile, many have supplies to unload that would otherwise be stashed in a school basement or end up in the trash. The wish list for Asia Maxton, a teacher at Violetville Elementary-Middle School, included something simple: pencils. “Just little stuff like sharpened pencils are really hard to come by,” said Maxton, who was prowling the aisles of the building, at 1224 Wicomico Street last week. In the past, Maxton would have to ration her pencils and only leave a few out for students. But lately, as a result of getting an ample supply from the Swap, she has been able to maintain a steady amount through the school year. She’s been participating for a couple of years in the Supply Swap, which allows teachers who pay a small annual fee of $10 to fill up to five baskets of supplies, as well as drop off any superfluous books or goods. 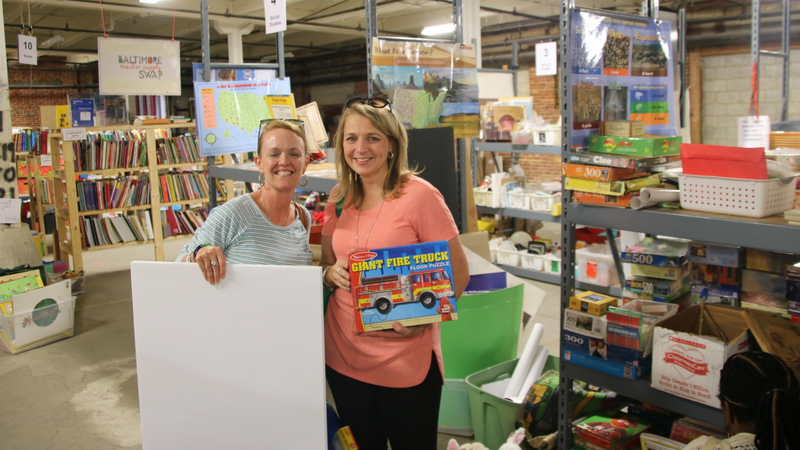 It has given away more than $90,000 in school supplies since its opening in summer 2014. For Maxton, a drama teacher at the southwest school, the service provides not just supplies, but a bit of relief from the stress that comes with teaching 19 classes a week. “We make millions of decisions as teachers, so to make one less decision knowing, ‘I’m not going to spend 10 minutes shopping because we already have sharpened pencils’ is really significant,” she said. The program, co-founded by Melissa Badeker and Kathleen Williams, is available to educators, home school parents and preschool operators. It began in a small church, but eventually moved into its current 1,800-square-foot warehouse. They are sustained by memberships, individual contributions, and selling highly valued donated items. Badeker and Williams, who met while rooming together as volunteers at the House of Ruth, open the Swap on Thursday and Saturday afternoons all year long. A former teacher who worked in city schools for five years, Badecker said what inspired her to start the organization was knowing how much money teachers spend on their own classroom supplies. “A lot of people don’t know that teachers spend hundreds of thousands of dollars every year out of their own pockets,” she said, noting that she often spent more than $1,000 in a given year. “I bought consumable supplies such as composition notebooks, pencils and pen that the students went through very quickly,” she said. The idea that teachers could be so under-resourced struck her as fundamentally wrong. “It’s amazing to me because we’re putting our children’s futures into their hands and not even giving them the tools to do anything about it,” she said. Since starting the Swap, Badeker has spent substantial time looking at Baltimore’s education system to figure out why there are so many unused supplies and, at the same time, so many under-equipped teachers. “What we find is that principals aren’t spending the money appropriately for a variety of reasons,” she said. Although Williams doesn’t think their service will force schools to totally rethink their methods for supplying teachers, it is steadily picking up steam as the go-to place for any miscellaneous classroom needs. “We don’t think we can fix things but we’ve hoped all along we could make a difference,” she said. Two teachers from the Mt. Zion Christian Preschool in Howard County shared the concern about scarce resources. Kristin Robertson, on her fourth visit to the Swap, was there with first-timer Ann Thompson. Maxton, meanwhile, was filling most of her shopping cart with colorful costumes, board games and even puppets to equip her classroom for the upcoming school year. She also had a bag full of letters to drop off from students thanking the “Swap” for all the goods it let their teacher bring back. Maxton said she and her students appreciate all that the Supply Swap does for resource-poor city classrooms. Badecker said Baltimore Teacher Supply Swap is always in need of pencils, pens, reusable bags, and copy paper. The website also has information on hours of operation and how to volunteer.